Hoi An one of the city have three major rivers that is Thu Bon river, Truong Giang river and Ðe Vong river and with a mangrove forest of coconut water is a wonderful destination. The mangrove coco forests Bay Mau located 5 km to the East of Hoi An city (2 and 3 village, Cam Thanh commune) is surrounded by water. It was a revolutionary base in the resistance and is one of the core zone of biosphere reserves world Hoi An - Cham Island. Bay Mau coconut forest is not only a monument has special historical value, it is also a unique ecological area with water flooded forests c-harming landscapes. Nowaday it have been narrowed to only 58ha of forest, but coconut is still a rare feature in wetland. In here, with seagrass ecosystems. This is also a place of many marine species of value, especially shrimp, crab and molluscs. Last year, UNESCO has recognized Hoi An- Cham Island is a biosphere reserve in the world. Including this area. 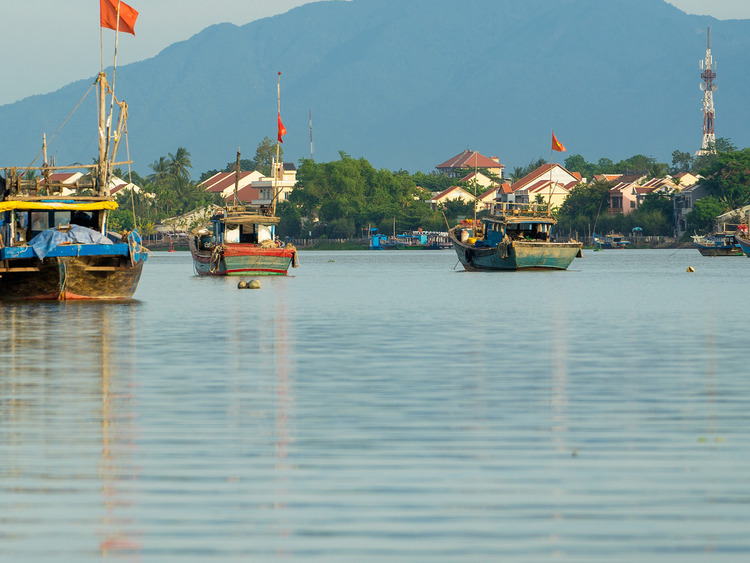 Your day will start with a scenic drive from port to Hoi An. After 1 hour driving, you will arrive at Cam Thanh commune. Take a walk to explore a daily life of local people, some house made by only coconut tree products. Arrive at local boat station, a wooden boat will take you cruising along Thu Bon river, lets enjoy a fresh air and peaceful view of local fishing village on river banks. You can take bamboo basket boat ride to explore Bay Mau coconut mangrove forest. You will have a chance to see how a local fisherman catching fish by throwing fishing net. A basket boat dance in water will make your day unforgettable. Continue exploring a mangrove forest and then return to a local station, where your bus is waiting to bring you to visit the small Hoi An Museum of History and Culture. The museum was built on the former site of a Quan Cong temple and houses many exhibits documenting the foundation, development and decline of the ancient town of Hoi An. Your next stop will be the Assembly Hall of the Fujian Chinese Congregation, founded in 1697 by the Fujian Chinese merchants of Hoi An as a venue for community meetings. This temple is architecturally unique and boasts artistic decorations and beautiful statues. Your tour will continue with a visit to the Japanese Covered Bridge, built in 1593 by the Japanese Community of Hoi An to link their neighborhood to the Chinese quarter across the river. The bridge was roofed so that it would shelter pedestrians from both rain and sun. Over the centuries the ornamentation of the bridge has remained faithful to the original Japanese design. Your next stop will be one of the old houses in Hoi An, Phung Hung Ancient House or Tan Ky House. This particular house was built almost two centuries ago as the home of a Vietnamese merchant and its design illustrates how the local architecture was influenced by Chinese and Japanese styles. You will then head to a Hoi An craft workshop, where you will have the opportunity to see various traditional local handicrafts, such as carpentry, ceramics, mat weaving, embroidery, paper lanterns, conical palm hats, etc. Finally, your coach will follow the same route back to port for embarkation.